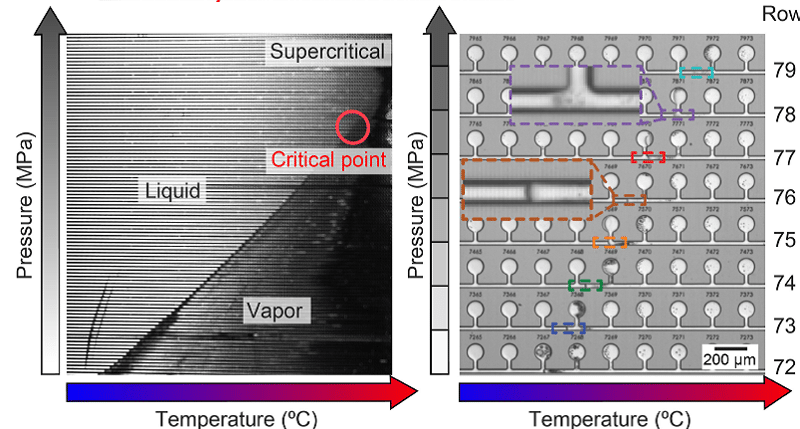 Nucleation is widely studied in many scientific and technological processes; however this blog is inspired by a relatively new field of application, phase-diagram-on-a-chip. Generally speaking, phase diagrams are graphs used in the field of physical chemistry to show various phases of a substance with changing conditions of pressure, temperature, etc. When a phase diagram is directly generated on a micro-chip (as opposed to the traditional way of drawing it on a page from experimental data) it is called a phase-diagram-on-a-chip. A self-explanatory image from David Sinton’s work at the University of Toronto shows one such phase-diagram-on-a-chip. The bulb-like structures are the sites where the nucleation and thermodynamic processes take place. The thermodynamics inside each bulb is governed by the pressure-temperature conditions, and all the bulbs combine to form a final phase diagram. The process of generating a phase diagram may involve the combination of hundreds of such tiny bulbs, but it boils down to the multiple simultaneous physical phenomena going on in any of the individual bulbs. Phase change, cavitation, heat transfer, surface tension and viscous flow are the main physics involved. Therefore, in this blog I will talk about a basic example that incorporates all these physics. FLOW-3D is truly a multi-physics simulation software that allows different physical models to be activated, depending on the problem in hand. The relevant models for the nucleation problem are discussed below. FLOW-3D accounts for the mass transfer that happens between a bubble and the surrounding liquid due to liquid-vapor phase change. Within the model, there are further options like constant pressure bubbles with no phase change, constant pressure bubbles with vaporization, adiabatic bubbles, thermal bubbles and thermal bubbles with phase change. For this problem, the thermal bubbles with phase change model is used. When the thermal bubbles with phase change model is activated, FLOW-3D calculates cavitation pressure as a function of the local fluid temperature and the phase change properties of the fluid. The temperature-dependent cavitation model is useful when simulating thermal bubble printers. FLOW-3D has first-order and second-order monotonicity preserving heat transfer solvers, with both implicit and explicit numerical approximations. The first order scheme is suitable and robust as long as high thermal gradients are not expected. In this case, the first-order scheme with implicit numerical solution is used. FLOW-3D’s viscosity and turbulence model has both laminar and turbulent flow modeling options. Since microfluidic processes are typically low Reynolds number flows, laminar flow modeling has been activated for this case study. The surface tension model in FLOW-3D allows for tracking the free surface of the fluid with increased accuracy. This is of paramount importance, especially for simulations involving the ejection of droplets and the formation of bubbles. The problem setup is fairly straightforward with a heated plate sitting at the bottom of the fluid. The plate is a heat source, continuously releasing heat into the fluid. The properties of the fluid used in the simulation are similar to those of thermal bubble printer ink. Important fluid properties in this simulation are density, viscosity, specific heat and thermal conductivity. For the vapor phase, saturation pressure, saturation temperature, latent heat of vapor, vapor specific heat and superheat temperature are defined. As the fluid surrounding the plate heats up, its phase changes to vapor, which then leads to nucleation. The vapor pressure causes the creation of a cavity that pushes the fluid, still in the liquid phase, around it. This cavity is tracked and estimated by the cavitation model. Animation showing the temperature of the heated plate along with the creation, evolution and subsequent collapse of the bubble from multiple angles. The results above show that FLOW-3D is a comprehensive CFD software for simulating multiphysics processes found in nature or conducted in a lab.